Ramses Wissa Wassef was born into a prominent Coptic Egyptian family where art had always held a special significance. His father, a lawyer and politician, was an influential member of the nationalist Wafd party who played an important role in the struggle for Egypt's independence. 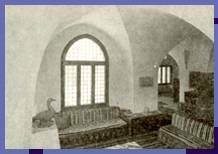 A frequent visitor to the home was the well-known sculptor Mahmoud Moukhtar whom Ramses greatly admired as a child. Already by the age of five he had shown uncommon artistic talent and had earned himself the nickname "the artist." He completed his primary and secondary studies with honors at the French College in Cairo and later went on to study in France. Although his initial ambition was to become a sculptor, he studied architecture at the Ecole des Beaux Arts, in Paris. There he followed his prescribed course of studies without neglecting drawing and sculpture. It was at this time that his first thoughts concerning the teaching of art and the role of the teacher emerged. Ramses had been very disappointed by the academic teaching he had received and he viewed this education more as a detriment rather than an aid to fulfilling creative expression. 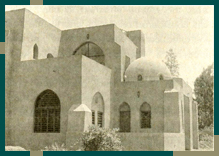 In 1935 he received his diploma after submitting a final project entitled, "The Potter's house in Old Cairo". Even then his interest in Egyptian crafts was evident. "What I could not explain was why our own civilization should produce such coldness and ugliness to replace the wealth of indigenous architecture. I used to like walking through the old parts of Cairo, but even there hideous fungus-like "modern" buildings are going up, insults to human sensibility. And it is even sadder when it happens in the open countryside. I also realized from my travels that there were degrees in the poverty of modern architecture; but towns and cities everywhere are increasingly coming to look like machines"
For Ramses, the "modern architectural revolution" which had hit Cairo was producing a multiplicity of buildings constructed without any sense of aesthetics but rather for their fast rentability. From this point on, Ramses was firmly resolved to never sacrifice his artistic vision for current rends in construction. He sought rather to devise a synthesis that gave his country's architecture a national character one that was influenced by the way of life of its people, its climate, its traditions and the country's vast cultural inheritance. It was in the course of one of these trips to Upper Egypt. In the company of his students, that Ramses discovered the beauty of the Nubian villages. There the houses are composed of mudbrick vaults and domes, a style that perpetual, is a tradition going back to the early Egyptian dynasties. This discovery revealed to Ramses the connection he had been seeking with the past. It was not his intention however to return to this method completely, but rather to bring it back to life by reinterpretation. Here, Ramses describes his discovery in Aswan. "I had just visited Aswan, where I had been struck by the Beauty of the Nubian houses in the villages of the area. I learnt that it was still possible to find bricklayers who could make vaulted roofs for houses. I felt a strange excitement when I thought that these same methods had existed since the first dynasties of the Pharaohs. They had survived throughout Egyptian, Coptic and Islamic history, and were still used in popular architecture. I decided to make use of some of these bricklayers from Aswan and turn their experience to account in building vaults for my school." In order to build with vaults and domes, Ramses had originally brought workers from upper Egypt to construct the first rooms of the center. Realizing the impracticality of bringing these builders, he had hoped that the children themselves would embrace this form of architecture and use it for their own. construction. In this way he would plant a seed for future generations. Unfortunately this did not happen on a large scale. For these children, the stigma attached to clay, which was considered unhealthy and for the poor and uneducated, prevented them from ever adopting it. Ramses did however teach some of the young male students at the center to prepare mud bricks and build walls in the traditional manner. Under Ramses' guidance, their first project was to build a small chicken coop in adobe using Nubian features (vaults and domes). It was to be a miniature of the weavers' future workshop. At the center, the buildings were distinctive for their simple beauty and provided the weavers with just the right atmosphere in which to work - one that protected them from the heat and shaded them from the glare of the sun. The qualities of this project received formal recognition when in 1983 the Aga Khan Architectural Award was given. Wissa Wassef's architectural achievements are numerous and varied. The best known are his Art Center at Harrania, Mahmoud Mouktar's Sculpture Museum in Cairo, two church-cathedrals in Zamalek and Heliopolis, his own house in Agouza, Habib Gogry's Sculpture Musuem and the homes of Mounir Nosshi and Ceres Wissa Wassef, also at the centre in Harrania. Many varieties of craftsmanship grace his buildings in harmonious blend - his stained glass window designs winning particular acknowledgment. For this he was awarded the National Prize for the arts in 1961 and 1984. Indeed Wissa Wassef was a remarkable man, for his talents are alive not only in the students who perpetuate the crafts, but also in his structures which will remain monuments of his diverse abilities for years to come.